Bring the Family to the best firework display in the area. We are pleased to announce that our annual Firework and bonfire extravaganza is back, you are most welcome to join us on this special night. 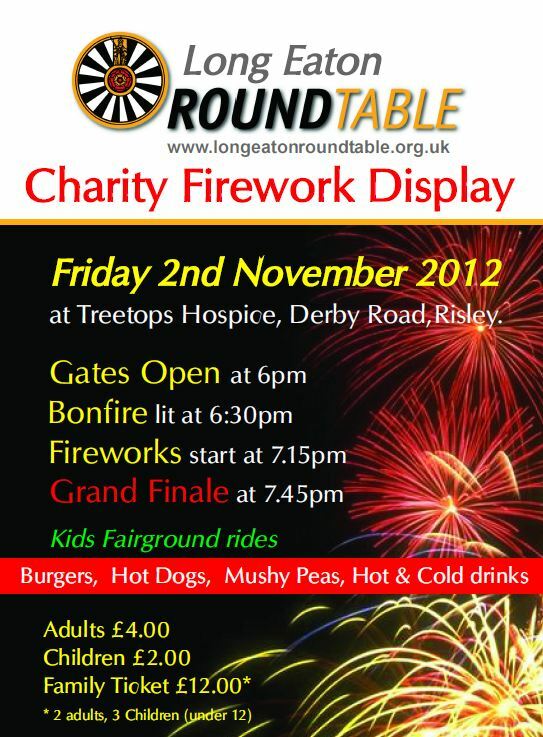 The event is held at the treetops hospice in Risley, on Friday 2nd November. Gates open at 6pm. Hot food will be available as well as Hot & Cold drinks. Why Not Join Round Table if your male and between 18 – 45 come along and see what its all about. We organise fun events that bring the whole community together, then give the profits to local causes. Join Round Table and you will have fun, make lifelong friends and make a real difference to you and your community.